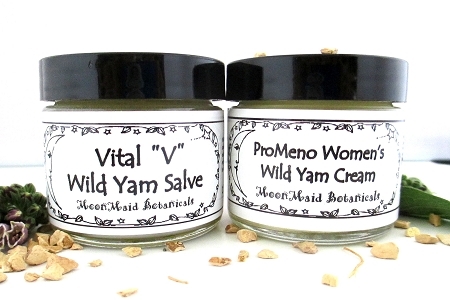 This Combo includes one each of our ProMeno Women's Wild Yam Cream and one Vital "V" Wild Yam Salve. Our two most popular products!!! I am loving this cream. Not only is it moisturizing but it is helping balance my hormones like nothing else has. I am so Grateful to have found this product and actually it was a doctor that lead me to Moon Maid. These products are healthy, and if used faithfully they work. They help a lot with dryness, the moisture they give feels really nice. I'm so grateful to have found my way to the products from Moonmaid Botanicals (on the recommendation from a fantastic yoga teacher). I use both the Vital V and Pro Meno regularly - they have helped so much with perimenopausal symptoms. I also love the nettles offered here - all the products I've tried from Moonmaid genuinely feel supportive, especially in these times of transition, and I so appreciate all the valuable info and products available on this site. Thank you Cynthia for supporting women through Moonmaid Botanicals! very happy with these products. The vital V is amazing. I had tried progesterone creams and they only made my hot flashes worse and did not help with the vaginal dryness. Vital was instantly soothing. I have been using Pro Andro Men's Wild Yam Cream for several years and am very pleased. I am well over 50 and believe it helps increase my testosterone production. I would recommend this product to others especially since it is all-natural.